If you are having a problem with your PC, we’ll figure out how to solve the issue. Whether your system is running slow, plagued by viruses or malware, or a program has stopped working properly, we can help. Even if your suffering from a corrupted hard drive, we can help fix the problem. Our engineers are experts and are standing by, waiting to delve into your computer and suss out what is keeping it from performing properly. We can solve most problems in 2 to 3 days, and some of them may not even require you to step into our office. With remote support, we can access your computer and determine what needs to be done. In more extreme cases, an office visit may be necessary so that the problem can be fully dealt with. Regardless, our technicians will have you up and running as quickly as possible. There is one thing that we all fear in that moment when we press the power button on our computer – is it not going to turn on this time? Then, the worst happens – it won’t turn on. There are no sounds, no lights to imply that it is simply taking its time to light up the display, nothing to indicate that your computer is anything more than an expensive paperweight. Even if your computer won’t turn on, it is not always the worst-case scenario. While your computer may not be accessible via normal means, there is a higher than likely chance that your files, photos, and information can be retrieved through a data transfer while your computer is being diagnosed. The most likely scenario for when a computer will not activate is a failed piece of hardware – the components that make our computers work. Determining which component this is and replacing it will solve the problem. Is Your Computer Too Loud? Sometimes, our computers are incredibly loud in all the wrong ways. When your computer is operating normally, your fan should only be truly noticeable when it is trying to do too much at once. Generally, slowing down whatever you are doing will solve this problem – however, if you’re computer continues to sound like this, even when you have stopped using it, there is a real problem at hand. The most common reason for this is a dusty fan, and it is easily taken care of without even needing to be brought in, through the use of pressurized air. However, if the application of pressurized air does not solve the issue, then it is time to call in the professionals to help diagnose, and solve, the problem. What can be more aggravating than not displaying anything, due to the screen not turning on, is when your computer does turn on, but becomes trapped in a continuous loop during the startup process. Sometimes, this can be caused by an eternal device or disc that is causing a hiccup in the startup process – possibly by taking too long to load, causing too many requests at once, or simply not starting up itself. The first task is to remove these devices – CD’s, DVD’s, USB flash drives, memory cards, and external hard drives being the most common devices – and if your computer still won’t startup properly, the problem is a bit more complex. Like most startup issues, the likely culprit is a malfunctioning piece of hardware – such as the motherboard, CPU, memory card, or graphic card. Identifying which component is negatively impacting your computer is the first step and replacing it is the next step. Perhaps your problem is more frozen than most. When a computer freezes during the startup process, only to restart the process, it is almost always because of one of two reasons. The first step is to clearly identify which of these two issues your particular computer is suffering from, and then evaluate a solution that will allow your machine to run properly. Our computers are actually very intuitive, and they restart themselves in order to protect themselves from damage. The first type of problem involves a virus, malware, or some other form of intrusion that otherwise inhibits the performance of the computer – either by locking it down, slowing it down, or locking it into a cycle of freezing and restarting. Our technicians can quickly identify the issue and restore your computer to proper working condition – whether that involves cleaning out adware that has snuck into your device, removing problematic software, or even targeting a specific virus that has taken root in your system. The second issue is far more serious – involving a piece of hardware that has malfunctioned. If your computer is unusually hot to the touch, it is most likely overheating, causing it to freeze and subsequently restart itself in order to regulate its temperature and not meltdown. Any number of hardware components can cause an issue like this – such as a damaged power supply, a faulty graphics card, or even the hard drive being inhibited in some way. We can identify which part is not working properly and replace it in a timely manner. It’s happened to all of us one time or another – your computer isn’t loading webpages or programs quickly, it takes minutes to open up your internet browser, and even longer to actually search for something. Your computer has slowed down, and it can be more than just a nuisance to see a popup mention an unresponsive script over and over again. While it is not unusual for a computer to slow down over time as it grows older, but it can even happen to a new computer. Bring your computer in to us and we can help identify any issues that might be impacting that speed of your computer – such as being overloaded with programs during the startup process, its memory reaching its fill, or even too much space being taken up. 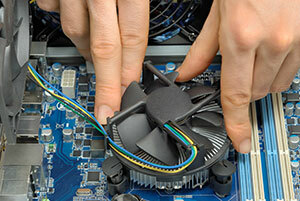 We will help you fix your computer and increase its speed back to acceptable levels. While laptops come with attached keyboards and touchpads, the typical PC comes with a wireless mouse, printer, and keyboard or one that has to be plugged into the computer in order to work. But, what happens when they don’t work? The simplest explanation is related to the software programs that allow these devices to work in concert with your computer – updating them almost always solves the problem. On the other hand, it could be an issue with a piece of hardware – such as the motherboard. For those that are connected wirelessly through the internet, it is always important to check that they are connected. Your computer is on, everything is working properly, yet you cannot see anything on the screen. No error messages appear to inform you that something is wrong or taking too long to load, it’s just black. First, check all of the cables that connect into your computer – as it is possible for one of them to become slightly disconnected. If that doesn’t solve the problem, it could be because there is an issue with the monitor itself. Another possible reason is related to the graphic card – this hardware component is what allows your screen to display. If this is not working properly, then it needs to be replaced quickly in order to allow your computer to function properly. Our technicians are on hand to solve all problems that could possibly be affecting your screen in a negative manner. Simply call and set up an appointment and we can get to work determining what is afflicting your system.